I saw two movies this weekend. One was great and one was terrible. I didn’t have high hopes for Waitress, simply on the basis of it looking an awful lot like a romantic comedy. As it turned out, that was the least of its worries. On a worldview level, this movie is an absolute disaster. Miserable marriages, extramarital affairs with little to no consequence, and an absolutely dismal view of men in general. The constant references to an unwanted child made me sick to my stomach, although there was some redemption on that score eventually (and it was good to see that abortion was specifically rejected as an option). If that weren’t enough, the movie failed on an aesthetic level as well. The characters were all completely flat– no development or really anything interesting at all. Everything was very typical: the quirky girlfriend who finds happiness with the quirky guy, the trashy girlfriend who finds happiness with someone else’s husband, the romantic-but-spineless love interest. 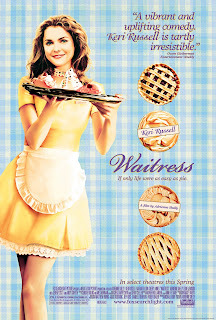 The main character’s only distinguishing mark was that she made good pies, and somehow that was supposed to set her apart from the rest of the banal cast. There were bright spots: Andy Griffith’s character was enjoyable, and some of the initial awkward dialogue with the romantic-but-spineless love interest was funny. But overall, as a Christian and as one who likes a good movie, this one was pretty lousy. Now Once, on the other hand, is a fantastic movie. The music alone makes it worth the time (it won the Oscar this year for Best Original Song). But there’s a lot more to like. I loved the reality of it: the grainy, shaky camera work, the awkward pauses, the uncertainty of the characters. I also liked it because it’s an incredibly unromantic romantic movie. That will make more sense if you see it. Once is the story of two musicians connecting on an artistic and personal level, but mostly artistic. As a music person there was just so much to like & “get”– like the exhilaration as their music came together, the connection of their voices & instruments, and the general Irish beauty of the whole thing. Going back to the worldview level, the way things developed was surprising but somehow right… but that’s all I’ll say about that. As a special bonus, the girl is Czech. 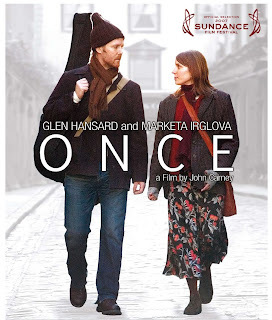 Once is a delight on every front: the characters are great, it’s non-commercially beautiful, and the music is incredibly, refreshingly real.The next time you’ve had a long day, pour a glass of wine and watch this movie. OMG that song that won from this movie was AWESOME! Awww, I’m sorry you didn’t like Waitress! Good thing y’all watched Once on Friday night, then.